Only two items this week…I haven’t really made baby sweaters since my kids were babies. And we all know they are not that any more. There are only two kids in the next generation so far and my sister Jane is a knitter herself, so there was no real point. Gotta say, hats are WAY easier….there are so many more stitches in this sucker than any hat. Also way more design choices, potential problems. Having to rip back a few times only adds to the psychological issues. I probably should have aimed for newborn size instead of the second size, less knitting….BUT, I used three whole stitches from “THE BOOK” (A Treasury of Knitting Patterns. Barbara Walker. 1968). Wheat Ear Rib, pg 43, Cloverleaf Eyelet Pattern, pg 169, and Eccentric Cables, pg 241. I thought I had been making too many hats, and I needed to leave my wheelhouse for a bit. I have made over 200 hats without patterns now and I make design choices almost automatically, for good or ill. It almost never takes longer than walking to the kitchen to make a coffee to get me unstuck anymore. Also, I couldn’t figure out how the wheat ear rib would be done in the round. I think I have figured it out, but I thought it was cheating if I wasn’t sure it was the same stitch exactly. I have to follow my own arbitrary, fictitious rules on this project, after all. I have an issue at the back of the collar. We are going to Toronto this week to pick the kids up from university, so I will try to visit the only grandniece I have and see how bad the problem is. I am pretty sure I can jury rig it easily enough. I am pretty vigilant these days about writing down the hat patterns, but I figured this was a dead loss and I quit writing it down somewhere near the middle of the raglans. I am not really fussed about the look of the raglan edge, but better done than perfect as someone used to say. A lot. On our way home from Quebec City, we stopped in Plessisville at the Brassard et Fils weaving supply store Near the cash they had this (sadly discontinued) Misti Cotton which is a blend of pima cotton and silk. It felt so soft I couldn’t leave it there, so I bought three skeins. I immediately knew that I wanted to make neck warmers with it. I also knew that I had to break into the cable chapter, so I did this to use up a whole bunch of different cables. I started at the bottom of the collar part with Classic Mock Cable, pg 115 and Four Stitch Cable Crossed Every Fourth Row, pg. 241. Just before the collar part finished, I turned around as if to do a short row so that I flipped back and front. I continued down the yoke part turning the mock cable into 4 x 4 cable then 6 x 6 cable. I turned the 4 x 4 cable into 6 x 8 cable then 8 x 10 cable. I was just trying to constantly increase as I went along. I had measured and knew that I had to end up with about 2 1/2 times as many stitches at the bottom of the yoke as I had on the collar part. I created new cables between the old ones which started as mock cables and transitioned into 4 x 4’s. At some point I was REALLY glad I wasn’t trying to follow someone else’s pattern instructions because I would have had to think too much. With the baby sweater, this takes care of all the simple cables….yeah! And it feels like a warm hug so, double bonus points. 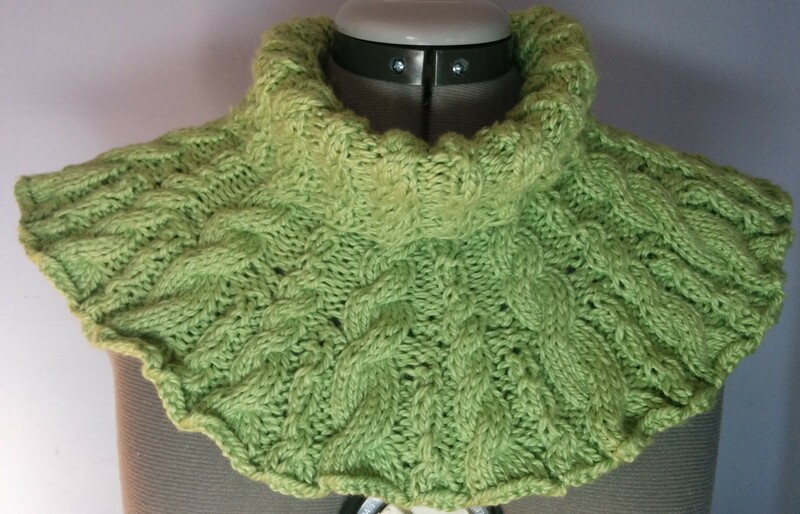 This entry was posted in Barbara Walker and tagged A Treasury of Knitting Patterns, baby sweater, Barbara Walker, cables, cowl, neck warmer on April 28, 2015 by gillianknitter. I think it looks great Gillian. Your grandniece is pretty big so i wonder if you will get your answer. Beauty in thread yet again! thanks Nancy..I am glad the void is not totally empty! 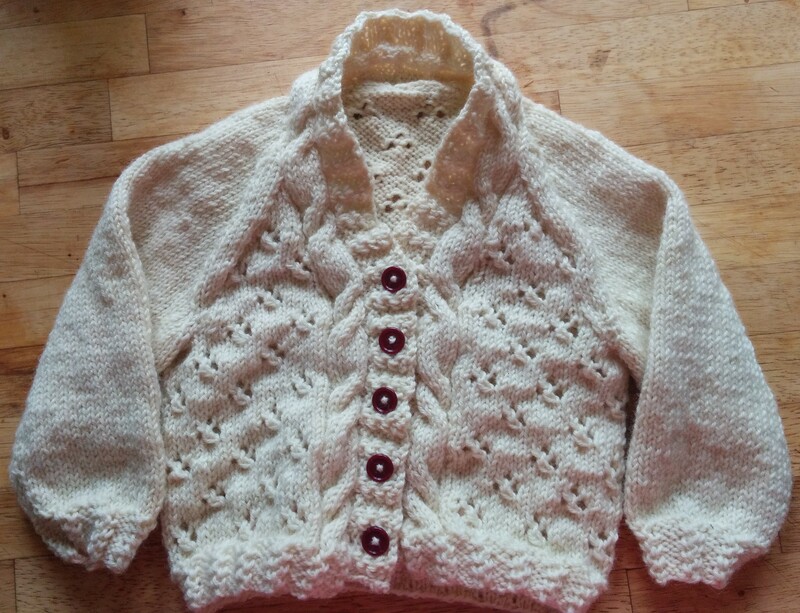 I think the baby sweater looks really nice – but a lot of detail. Good luck with the rest of the chapters! The baby sweater is adorable. The raglan sleeve detail adds a lot of interest and extra texture. The neck warmer looks very snuggly…hope you don’t need it until next fall/winter.